This Indicator is a unique, high quality and affordable trading tool because we have incorporated a number of proprietary features and a new formula. With only ONE chart you can read Currency Strength for 28 Forex pairs! Imagine how your trading will improve because you are able to pinpoint the exact trigger point of a new trend or scalping opportunity? Arrows in sub-window to show strong currency momentum GAP will guide your trading! Warning signs in the main window of the individual chart when the base or quote currency is in oversold/overbought zone (outer market Fibonacci levels). Pullback/reversal alert when currency strength drops back from the outer range. Special alert of a cross pattern. Available with multi time frame choice to see quickly the TREND! 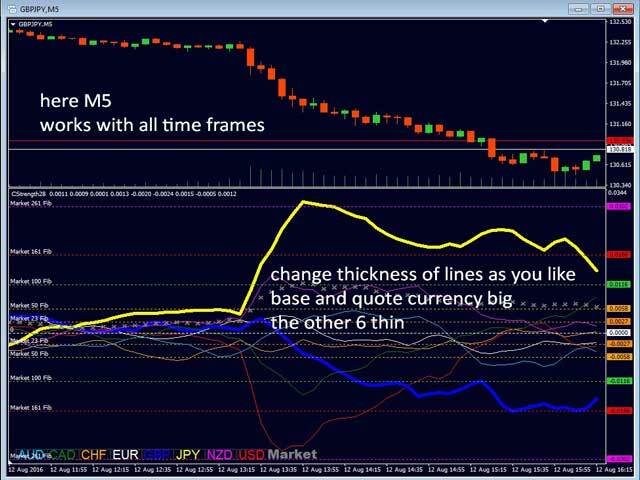 The currency strength lines are very smooth across all timeframes and work beautifully when using a higher timeframe to identify the general trend and then using the shorter timeframes to pinpoint precise entries. You can choose any time frame as you wish. Every time frame is optimized by its own. Built on new underlying algorithms it makes it even easier to identify and confirm potential trades. This is because it graphically shows whether the strength or weakness of a currency is increasing or not and how it performed in the past. These features were designed to help make it easier for you to not only identify which are the strong and weak currencies but to also show you when to trade, when not to trade and when to take profits. 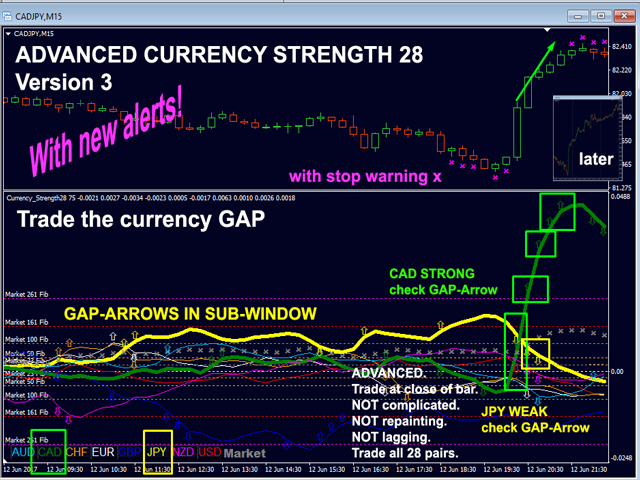 Advanced Currency Strength28 Indicator works on all THE 28 currency pairs. It is a new formula, and the very new features are Market Momentum and dynamic Market Fibonacci Levels which adapt to current market activity! Market Momentum is the 9th line. This is a great advantage and new in Forex trading. When you learn how to use the proprietary features such as the market momentum and dynamic Market Fibonacci you will be able to tell whether you want to trade with the trend, look for a trend continuation or a pullback. All the graphics are based on the new buffers which represents historical dynamic Market Fibonacci levels. Now you have the historical view and you can optimize the settings to your trading style and timeframe! Use “open chart in new window” if you do not want to interrupt the indicator. Stay within the trend (currency GAP) of the higher time frame. Look for the currency double-GAP as trade setup. SPECIAL: To update the MT4 chart history 7 support charts will be opened (see manual)! This function can be deactivated. Trading Forex for around 4 years and I've used some Currency Strength Indis and Heat Maps in the past. This one is the BEST I've ever used, is far more than that, and cost A WHOLE lot less than what I paid for others. To be able to switch back and forth to any pair, any time frame with a couple of clicks of the the mouse as rapidly as it handles it on one screen is just awesome. Bernhards support is A++ and I notice he is always upgrading his work which is a sign of a true professional. Can't wait to add the others as I master the use of each one along the way. The indicator helps to find good entries. Bernhard is very helpful. Indicator really helps me in staying with the trend direction and being first into the forex pairs that are going to move the most in a trend. thank you very much. great support very fast and thorough too. Very much, I can spot the best momentum using your indicator. Bernhard's indicator are very professionally developed. His support is outstanding. His indicator suite is all one needs. To be frank I don’t think Bernhard has the ability of organising an over 266 fake review guests just for the purpose of lavishing an undeserved praises on his product. There must be something real and authentic about it. Second point, Bernhard is helpful, patience and yes, very responsive with no waste of time. I transacted 18 emails in total, with questions and clarity assistance regarding his Advanced Currency Strength28 and Advanced Currency Impulse Indicators I leased from him. He replied to all those emails as with practical illustrations on how to go about things starting from installation and so on. He provided his clients the choice and opportunity of reaching him through his personal email something which only a tiny percentage if any at all can offer. The only channel you have is reaching them through the standard platform in the MLQ5 website. What if they don’t even bother to reply you or are slow in replying? Bernhard deserves a well earned credit, that for sure. Now on the key personal issue, I am a novice less experienced retail trader who as a result of past poor experiences, is no fan of manual trading, not anymore. Besides, manual trade is a wholesome burden for one to sit on a chair watching and waiting for signal and alerts for you to press the button. I have a full time job and this is only a means to a supplement income. Ideally I am looking for a credible or authentic EA compatible with Bernhard’s Indicators to execute auto trade on my behalf, doing the exact same job as I would manually do. Can someone help me secure that priceless EA to help me accomplish the journey? Unless Bernhard want to say to me that those his products are restrictive as are designed not to work with EA of whatsoever. Very good indicator, the support provided by Bernhard is outstanding and excellent. Market can be observed, useful indicators. Great Indicator. I can catch winning trades with great timing that I might otherwise miss. Great indicator! I just used in a day, with test capital usd100. Get back my subscription fee after 24 hours from profits. Buy this indi now, stop wasting money around! read ratrading's review it sums it up. The concept behind this strategy is excellent. More importantly, I really appreciate the effort from Bernhard to make people using his system successful. Thank you Bernhard!! I must say I personally have experience with this kind of trading before I discovered Bernhard and the CS28 indicator. The CS28 is just next level. It is an upgrade of my current system. I'm sure I'll be nailing the fx market now with sniper like precision. Thank you Bernhard. 35% profit within 3 day with ACS28, excellent. Thanks Bernhard !!!! I have acs and impulse now. These are wonderful indicators and I'm try them on demo trade. Thanks! I have now owned all your products, and really satisfied with your products, It now helps me to make a better decision on trading, I have been trading for over 3 to 4 years on FX. And your indicators has helped me to improve my odds of success. This is a review of the ACS28 and the Impulse indicator. Firstly, let me start off saying that this is not really meant to be a criticism of the developer per se. He is a businessman and is entitled to sell his goods with the best possible marketing. The issue with ACS and impulse is that the marketing material and videos are excellent - who wouldn't want to pay 90 odd dollars and have the opportunity to make millions by following arrows on a screen. Does the strength mater by this developer work? of course it does. They all do. My main issue is that it will take you weeks/months to understand all the confusing material that is sent with the indicators. I suspect the developer is not a native english speaker (no offence) but that clearly shows in the abject mess that comes in the form of the explanatory material. It is dense (I assure I am not) and extremely hard to understand. My advise if not to buy this or any other indicator from this developer. And those who are wondering why this indicator has so many positive reviews when I claim that its not that good, again thew fellow is a far better salesman than trader developer. Once the indicator is sold, the buyer is tempted with yet another magic indicator once the buyer writes a positive review. All good old marketing games on here. If you really need a currency meter, there are free ones out there on various forums that do the job very well and are backed by solid insights on how to use them. I used to a lot strength indicators, ACS28 is the most accurate and easy to using. It does require times to study, but it works very well after you figure out how it works. Best of currency strength indicators I´ve used. Faster than others. Do not utilizing PC like others. During few weeks I learned to read it. I´m using few timeframes (usually H1,H4,D1) and making decision on reading of ACS28. Whole FX, all 28pairs in one chart, like x-ray scanner. It is fully customizable and with alerts. Really good job, thank you. Just as everything, there is a learning curve to it, but once you know how to utilize it, it will be a very powerful tool in your arsenal. I used to work with another's strength indicators, but this one is really faster and more accurate. Doesnt lag, and you can take your trading decisions faster. Very good indicator ,he gives me tickets and I know when I have to leave, perfect with Impulse from Bernhards too. Excellent indicator, fast and saves me a lot of time. effective and very easy to use. Klasse Indikator, der einem im Forex Trading definitiv weiterbringt aufgrund der Top Übersicht! !Ebenso ein klasse Support von Bernhard!! Einfach nur Hut ab! Ich freue mich auf das Jahr!! Много покупал индикаторов, но этот индикатор самый лучший. Весь рынок виден, знаешь куда в следующий момент пойдет цена. Очень доволен. C'est un bon indicateur. Le double gap m'aide dans la prise de mes trades. J'attends avec impatience le combo signal qui devrait m'envoyer un message sur mon téléphone quand un double gap a lieu. Merci pour le support très très rapide! I did some research on currency strength meters, and decided on ACS28. Very pleased with my choice. Buying strong and selling weak makes sense, and this indicator helps greatly to that end. Coupling this with Advanced Supply and Demand indicator helps with the decision to enter, or not to enter. I also have the Advanced Currency impulse with Alert. Goes well with the others, and using all three is a great way to trade. Bernhard is exceptionally quick to answer queries and give help. Emails come back almost immediately. It has taken me a while to get used to the system, and I am still on a learning curve, but this is a great system and great service. At last I have found a Forex tool that does exactly what its supposed to do, the creator obviously knows what he is doing! Thanks Bernhard for the prompt responds to my query, you are just great, best support Ever. Exceptional product! would definitely recommend to anyone who would like to improve their trading! Thanks Bernhard. This is the best currency strength indicator I have used so far. It is becoming my primary goto indicator to filter out which pair I will trade. I purchased this indicator afer much searching for the right one in terms of currency strength. There are a lot of strength indicators on the market, but not one that has genuine reviews and testimonials like Bernhards indicators. I am still fine tuning my strategy with Currency strength and Impulse indicators and studying andf practising with it. This system gives a really clear indication more than anything else I have come across on the market. I am going to purchase the advanced supply and demand indicator of bernhards from the profits I have made with the Ac28. I would highly recommend these indicators as it will change the searching in the dark approach towards trading. I trade using candlestick patterns and trendlines usually. I rented this indicator hoping to improve picking key Reversals and it delivered admirably. On first day itself, it has made my Profits better and consistent. Will update after using it for few more weeks. But for now, Thanks to the Developer Bernhard for the excellent product. Hoping to buy the Impulse indicator soon..
Having used the ACS28 indicator for some time, I have become almost totally dependent on it to find and confirm my trades. Continual advancements and improvements reflect the time and effort the support team obviously put in. Documentation is excellent and support response is exceptional. Highly recommended. Bernards indicators have a clever build up with 4-5 indicators working both by themselves but also enforcing each other if you use them together. Together they give a fantastic overview of the forex market, helped my MTF-functions, arrows, supply/demand etc. There are lots of proprietary functionality that makes the trade decision better. 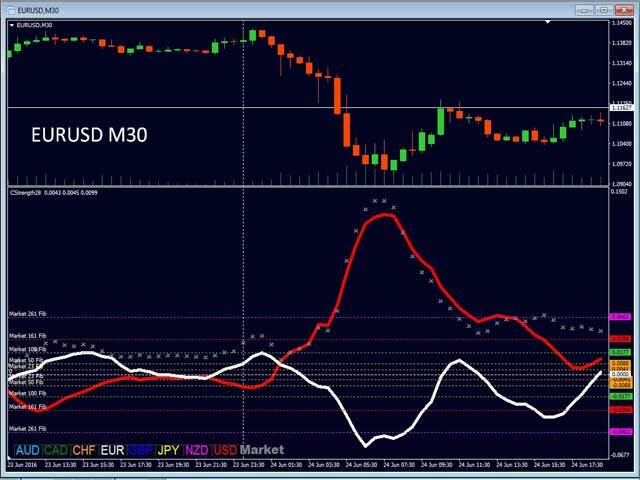 Finally, I appreciate that the documentation also includes a lot of input and examples on how to trade the forex market with the indicators individually and together. Les indicateurs de Bernards ont une construction intelligente: 4 à 5 indicateurs fonctionnent à la fois seuls mais s’appliquent mutuellement si vous les utilisez ensemble. Ensemble, ils donnent un aperçu fantastique du marché des changes, ont aidé mes fonctions MTF, flèches, offre / demande, etc. De nombreuses fonctionnalités exclusives améliorent la décision commerciale. Enfin, j’apprécie que la documentation comprenne également de nombreuses contributions et des exemples sur la manière de négocier le marché des changes avec les indicateurs individuellement et ensemble. Bernards indikatorer är byggda med en intelligent struktur med 4-5 indikatorer som fungerar både i sig själva, men också genom att fungera tillsammans och att förstärka varandra. Tillsammans ger de en fantastisk översikt över valutamarknaden, med hjälp av MTF-funktioner, pilar, utbud / efterfrågan etc. Det finns också mycket egenutvecklad funktionalitet som gör tradingbesluten bättre. Slutligen uppskattar jag att dokumentationen också innehåller råd, tumregler och exempel på hur man kan/bör handla på valutamarknaden med indikatorerna individuellt och tillsammans. Best currency strength meter I have found. I won’t trade without acs28! Support from Bernhard is excellent. I use the ACS28 indicator before I place any trade. It is invaluable in determining if the currency pairs are due for a move or if they might already be nearing exhaustion levels. It also helps me choose what pairs I should trade at a glance so I don't waste time looking through pairs that will not offer movement to give me profit. Strength28 combine with Currency IMPULSE and Advanced Supply Demand is excellent and complete trading system. This is the best indicator available. Mit einem Blick sieht man, welches Paar(28) man handeln soll, ohne mühsam die ganzen Paare durch zu gehen. Accurate tool for seeing current market siuation and trends..
Great Indicator I can recommend it to anyone out there! Works perfect as addition to my strategy. CS28 it's a real Indicator for currency strength helping us to have a bigger picture of the Forex Market. This indicator has really helped me find the strong trends and has increased my win rate. Highly recommended. Tired of being stucked with trend,lagging,repainting indicators ? This is the tool if you're serious about trading forex ! Great indicator and super support from Bernhard. Features in the indicator are well chosen and very clear to follow, easy adjustable to customers needs. At one glance you see which pairs are strong/weak so you're better prepositioned to take a trade. Once you get familiar with all the features your trading skills will definitely increase and so your results !! I'm trading forex about more than 10 years and had some similar currency strength tools but nothing can compare to this. This is really the tool I've been looking for . So Bernhard keep on going with your good work and may everyone here have many green pips . I got the ACS28 more than 2 months ago, the September 1, 2018, and a month later the Impulse too. I waited with the review, so that I can give an educated review instead of one based on a quick look. You must dip your toes into the water first, before speaking about its temperature. ACS28 gives you a very occurate picture of what the 8 worlds most important currencies are doing, both individually, as well as how they fit into the general market. In the beginning I didn`t fully realize how powerful that is! But as you gain some experience watching it, you start seing the market in the way you couldn`t see before. It`s not a joke! It is a truly incredible indicator that Bernhard and his team have come up with. A serious trading tool for everybody who is serious about forex trading! Unlike any other tool or system I have seen before. The support is great as well, Bernhard answered all my questions quickly, and the installation instructions were easy to follow. I highly recommend it! Personally, I have learned so much about market behaviour simply by using it, and my view of markets has been changed forever. Even though I`m still learning, founding new ways of using it, and constantly improving. There is no going back to the old messy charts with funny and unreliable indicators, like ever! No more double tops, tripple tops, heads and shoulders or price actions. Bernhard! Hats off to you and your team! Great job my friend! I am Using this indi for last 3 weeks. in simple word i can describe excellent. I just followed his instruction for successful trade setups. Dgap is unique. singals of when to go long and short is too good. and Bernard Support is too good. Great addition to my trading strategy. Love the indicator - very reliable and quick to respond to the market. I use it with the Advanced Currency Impulse with Alert. Its whole new level in currency strength trading. It allows u to see individual currency strength. Good stuff! I have rented ACS28 for a while. It is awesome and helped me a lot in finding trends. Thanks for Bernhard for the great support and prompt reply too! I have used the AC28 for over a year. It has been been indispensable! Thanks Bernhard Schweigert, for the great indicators. I can use this very successfully for me. Today I have all the indicators and can only say please keep it up. From me 5 stars for the good and intensive work. It is an Indicator with tremendous potential. It is an Indicator that has already had several versions and several improvements, in order to improve it and make it more powerful. It is not a novice Indicator. From what I have tested, it is quite assertive, yet it takes dedication on our part. The tool is this, now we have to study well all the potentialities of this, remarkable, Indicator. By studying it well, we are not only improving the timing of our entrys and exits, but we are also respecting the work of Mr. Bernhard Schweigert. At Advanced Currency Strength28, I joined the Advanced Currency Implulse with Alert and the Advanced Supply Demand. I will, in these days, begin to negotiate with this Kit. Having news about the performance of the Indicator, I will come here to update my analysis. Finally, regarding the availability of Mr. Bernhard Schweigert to assist us, is remarkable. Fast and accurate. I have rented ACS28.It is very good indicator. Amazing! I also have rented ACI with alert and ASD.The combination of those 3 indicators is very useful and accurate. This is the best indicator. Support is very awesome . I am very lucky that I found this indicator. I have rented ACS28 after communicating with Bernhards with many questions and he swiftly replayed with all answers. I love the support! After, reading the manuals carefully and testing it out and I'm glad I rented it out along with S&D and Impulse. Now I'm more confident to trade with a higher lot as I'm adapting it with my own trading style! What an indicator, makes pair and direction of trade selection makes very simple. I never had such a good result on success of trades before. 7 or of 7 trades in profit hitting TP. Support is also very prompt and very helpful. I give 5 starts for service and would give 10 stars for the indicator. Bernhard's support is impressive, the idea of trading based on currency is simple yet powerful, I hope to trade based on this system successfully. I never regreted buying the ACS28 and AC impulse.. It is awesome.. Very much reliable. And I can say that it increased my profitability as a trader.. This hardwork of the developer deserves a 5 star.. Not only because of the performance of the product, but also because of the very fast customer support..
Great indicator and excellent support from Bernhard! In Combination with Impulse Alert a very good system for trading. For me, this is the best value for money indicator of it's type. Without it, you have not got any idea of the real strength behind the currencies in the pair that you are trading. A must have if you are serious. Its a great indicator and makes all trading decisions more clear - no matter what is your basic entry strategy, checking with ACS28 before gives you an overall map of the market. Thanks Bernhard also for the swift support and answering all questions. Don't recommend. I regret buying it. The indicator Is a must ! thanks all the amazing job that Bernhard and the team of his did ! the support is excellent as well they respond within hours for any request ! I tried tons of indicators but this one is really awesome. The manual has to be studied seriously and after few days of training with a demo account your trading will change for ever ! Using ACS28 with CS Impulse is a very good deal --&gt; Thank you Bernhard ! wow.. this tool could easily be sold for $1000 and it would still be worth it. seriously. I rented 3 tools(CS 28, Supply and Demand, and Impulse) since January, 2018. Been using them on and off for 8 months now. One really needs to study the manual and learn the trading system to better take advantage of what the tools have to offer. If there are some tutorial training videos that someone talks and navigate the screens and give examples, that would definite make the learning curve easier for new users. The author have been very professional and responsive to my questions to guide me in the right path. I am looking forward to try out the Combo Signal tool. I wish there is an EA that would take the signals and make profitable trading decision setting the proper tp and sl levels, so we don't have to stand by the monitor or be on alert when a signal comes. I used Advanced Supply Demand first, and since then I no longer have to worry about the odds in my trading system. I have Advanced Currency Strength28 Indicator and Adveanced Currency Impulse w. Alert added and now see where my problem of my EA's were. The DAX and Dow can also do very well with the Advanced Supply Demand if they are interested. Just by watching the chart you learn intuitively quickly what happens and learn to handle the signals very quickly. Excellent indicator and Bernards support is great too!! One of the best indicators for MT4. It is a guide to the market, but education and learning is a must. You won't regret the time and money spent. I've been using the Advanced Currency Strength28 Indicator for a while and I am getting very confident confirmation signals for the patterns I like to trade. It's really amazing how this indicator can help to achieve a good setup and complement your own trading style. Wonderful job of Bernhard and his team. A must trading arsenal for your trading system. I have studied and rented the ACS28 indicator for a year. It is good indicator. it must has tool as serious trader. it will give you clear market direction and best pairs to trade every day. Also you got great support from Vendor. Thanks !! I rented ACS28 & IMPULSE. Very good and useful indicators. Thank you. The indicator looks promising. I am trialing with Impulse. Plenty of documentation and Bernhard is great with communication. Provides excellent overview of market and which currencies are strong/weak. I like the display and alerts. Will see how it performs for swing trading as that is my goal. Have tested it out on shorter time frames in demo and I get plenty of signals and opportunities to trade. Will update after 6 months of using it for swing trading. Thanks Bernhard. I use this in conjunction with the c28 impulse + alert and it works a treat! I am impressed by Bernard's market approach and GAP trading system. Great as a standalone trading methodology and could be a useful tool/filter to other trading systems especially considering flexibility in settings for ACS28 and Impulse indicators. Saves time for market analysis and allows cherry-picking favorable trades across multiple pairs. Can see market more clear. Promising indicator I have been using it for a short time and it shows the potential. Love Your Work Bernhard! 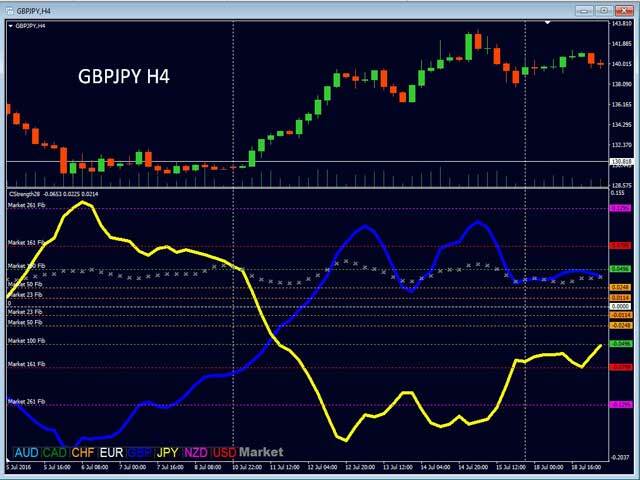 A fantastic indicator that can be adapted to suit the Forex or Binary Options Trader. Your support and education is always appreciated. A must have in any trading arsenal! Great indicator, highly recommended, Bernhards support is very swift. This is a good indicator, good supporting, Bernhard is very nice. A very good product that will make you pips if you take the time to study all the material. It makes you surprised ! An excellent indicator. I use it with ACS Impulse. Together they work well. Thanks for your products. So far this indicator has been good with helping to see which pairs to look at when scanning the market. Bernhard has been very responsive as well. It's worth the money! And amortises itself ;) Very helpful indicator! Este indicador en conjunto con el AC Impulse me estan ayudando bastante. Por el momento estoy practicando en demo y aprendiendo mas acerca este sistema. Tambien es bueno destacar la rapida respuesta de parte de Bernard. Gracias! I rented this indicator based on other reviews and found out that they were not exaggerating. I have rented CS28 Yesterday. It took some time to figure out how exactly it works. I made 23 trades from yesterday till now and 20 of them ended up in profit. My lot was 0.1 and tp was 10 pips (100 points). other 3 losses happen because I was still learning it and placed wrong order in wrong time. I think this indicator could turn into your holy grail if you just learn it well. Worth every single penny. Many many thanks to author. He was very prompt to answer me and helped me out with learning this indicator. I'm in touch with Bernhard's Advanced Currency Strength trading system just 2 days. After 2 non-sleeping nights and tons of blogs and manuals I can say it's a first well though-out system for forex I've ever seen. I tried many different Currency Strength indicators before, but all of them did nothing in comparison with ACS28. My own system is perfect for stock market, but too slow for forex. At last, I've found the solution. It's some kind of magic for me! Good luck, Bernhard & Co. I just started and tested it on a few trade. My goodness it is really profiting lol.... very very good indicators. Must have. It is better to have it with Impulse. A must have indicator for your strategy. a great help in identifying strength & trends. Very good Indicator, Lets you understand how the market is working and very supportive w clients. Thank you sir! I am a 65yr old engineer. I began MT4 fx trading 4yrs ago. I have settled down using 10.7 CSS , TDI and MACD along with my brain. They are just tools to be used for the rest of my life. I highly recommend them for both beginners and advanced. 1. I see both coloured AND clearly visible numeric visual information..not just an up red or down green arrow indication. I see speed, acceleration, flatness and relative location better than any method I've used. 2. The CS28 strengths appear to be normalized similar to the best features of the other indicators...including the unique MFib feedback (the first valuable feedback I've seen apart from the Bollinger band, multiple fibonaci MAs). 3. A very positive improvement to the 10.7 CSS...which is the best free currency strength indicator I've been using for several years. (Thanks to the stevehopwood forum who also did a great job in my education.). (This was my primary purchase reason for the CS28. I can have a more consistent P/L). However, the CS28 wins hands-down with the dynamic levels..a breeze to trade with during the Asian or London open. Better still...the end of session ME chart of the CS28 has now opened up (low stress) scalping opportunities...very predictable with the CS28 hooks and GAPs. The MFibs helps the decisionmaking process the same way the TDI does and sometimes even better. 4. Biggest thank you...for the single display, MTF, Multi-Chart, multi-strength and multi-alert capability. I have had to re-vamp my trading style and MT4 screen profile and settle down to trading or waiting for exits and TPs. No longer flipping and scanning endless charts. Operator user-interface is great. I though the price was a bit on the high side when deciding to buy but I have to change my mind. I may regret my review comments. I will shut-up now. Easy to use and good support from Bernhards! It is really useful in identifying the power of different currencies. Good and accurate indicator. very easy to read too. Big improvement on Strength and Weakness indicators I've been using up until now. Its real time! This indicator is amazing. It gives a perfect understanding about whats going on in the market and which pair to trade. Not seen anything better. impresionante ... autor trasparante y agradable.el indicador junto con su otro indicador de fuerza son los unico que evisto que funciona correctamente. SIN COMENTARIOS. felicidades bernhard ya tiene otro cliente de por vida y muchas gracias por resolver mis dudas y la ayuda prestada :). It's useful to me ! High quality tool with superb support. Have been using this for a while now and it really has improved my market scanning capability and quality in trading. Keep up the good work! Definitely it changed the way i trade . I was always searching for an indicator to provide accurate and responsive signals. Top recommended. Thanks Bernhard for the excellent job. Very good fast support and detailed instructions. Is the best indicator to spot volatility speed and trend in the market. Superb Indicator....value for money. Also great support from Bernhards. Best Currency strength indicator you will ever find anywhere.. Great Job Bernhard!! Kudos to Berhard, continues to add value to a great suite of indicators. Very good indicator . Thanks Bernhard!!! Fantastic indicator. By far and away one of the most crucial elements of my trading methodology now. It has taken me a while to learn how to consistently profit and understand how to find high probability entries with it. It is not a holy grail that you can just receive a message, pull the trigger and make money. 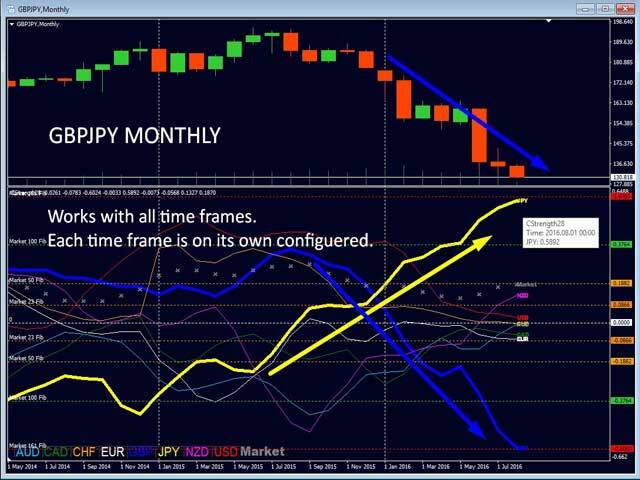 It helps you find the big movements in the market on the higher timeframes and then you can select high probability entries on the lower timeframes using that info. Bernhard is a true pro and gives a lot to his community. Thank you Bernhard. This has been a huge help in my path to becoming a trader for real. Best indicators and perfect support. Thanks Bernhard!!! Simply the best indicator I have come across the Advanced Currency Strength28 Indicator makes it simple to see when to enter or exit a trade in any timeframe you choose. To notice when a currency is getting overbought or oversold, this indicator should be used with Bernhard's Impulse, and also his Supply and Demand for a great system, his support is speedy, and always available, which is always useful to have . Fantastic indicator. Definitely the best I've ever used. The indications are precise and accurate; a small training period (2/3 days) is required and must be strictly regulated, following the instructions in the attached tutorial. In a few days (using mini lots) I earned an average of 20/30 euros a day; I use it in "scalping" mode and to trade position on larger time frames. The CurrencyStrength28 indicator is one of the BEST indicators that I have come across in all my many years of trading forex, it can be used as a stand alone system or to confirm the entry of any system that you may be currently using and the support that Bernhard provides is magnificent, it is even more of a gem when used with the IMPULSE indicator which is also one of Bernhards creations. Very good and useful indicator. Thanks Bernhard for great support. Very good indicator, easy to know the strength of each currency, I use ACS28 and Impulse at the same time. A must tools for trading. Thank you for your hard work. Great indicator! Currency strength is one of a few things that work in forex. And if you consider ever declining market volatility through the years, currency strength trading has its value. One of the best, if not the best currency strength indicators on the market here. But you have to make your decisions after have monitored at least 3 timeframes, just as with charts and trade with a trend. Information from just one timeframe can be misleading, one has to have general picture. Price is OK. Would be better if it would be for life though. There are very smart strength indicators which are completely free. I started to use Bernhard´s Indicators in late 2016, but had difficulties due to lack of time to monitor the charts. Now with the new versions is much easier to follow the market. And combining the Advanced Currency IMPULSE with ALERT with the Advanced Currency Strength28 Indicator makes it all easier because they let you know exactly how the market is evolving in real time. Thank you Bernhard for these excellent indicators and for the continued willingness to help. This indicator helps me to understand what market is doing. I use it to spot and confirm extreme market levels. Very useful. Very good indicator been using for a little over a year now. Recently had the pleasure of communicating with developer Bernhard also. He is always very helpful and quick to respond. Have had some really good trades using indicators along with nice price action setups. Die Advanced Currency Strength28 sind die besten Indikatoren die ich bisher kennengelernt habe, danke. Read the rules of the system again and again, then train on demo and never go back to your old work. I am relatively new to forex; been trading for only about four months now; gaining and then losing it all. I have researched extensively, studied and tried a number of strategies and indicators. Yet no consistent profit. No confidence, until I came across this indicator Advanced Currency Strength28, studied the rules of the strategy and started using it. Great indicator!! With this indicator I can see the whole market at a glance and easily spot trading opportunities. I now enter the market with confidence and make profit more consistently. I have finally found a trading system to settle with. Welldone Bernhard for providing this great and unique software. It really deserves 5 stars!!! This indicator is amazing..I am new to forex so it took me a while..don't give up and keep on practicing on a demo account. Analyze your trades everyday. I have more than recovered what I paid for this indicator. I find this useful to help me choose what pair I should be looking at for scalping. Good indicator! Advanced Currency Strength28 is simply the Best indicator as a standalone tool or a confirmation tool for all other indicators and signals. Think about the logic. You believe this boy in the class is really smart. By himself or by comparing with others? This smart boy is one of the 8 currencies. You don't know how good it is until you compare with others. Without currency strength, any breakouts, trend following systems, harmonic patterns, support/resistance, or supply/demand may look good by itself but will not necessarily have a decent follow through. Now you know what "false signal" means. Advanced Currency Strength28 is the Best in Class within the currency strength arena. I have compared it with many other currency strength meters, such as 10.7 CSS, ccFp, CM_Strength, csDash, CSM, nothing else can measure up so far. [Note that there is no support for those free currency meters. You must figure out how to use them yourself.] Those market Fib levels are unique - one of a kind. They help me see when the strength becomes too red hot to continue - an opportunity for reversal. I've been trading that formation live many times. No loss. Bernhard has worked out solid rules for trading with this indicator. Follow his rules you will make money. Highly recommended. If you are not doing well with this indicator, you are not doing it right. Look here https://www.screencast.com/t/F3Sq8IrdP 25 purchases!! Probably 20 are a total waste of money. This one and Impulse are worth every penny. Here is a skype message from a friend: "very good signals, close to 100% win". He is trading the crosses with a strong angle (default 38). So I wonder what did you do wrong? I personally have very good luck with the indicator but also with the help from my programmer. Here is what I am talking about. This is a dashboard that shows angles for each pair, each time frame. I watch the currency strength angle and select the pairs to trade https://www.screencast.com/t/U9cvWQaeu I do not blindly trade basket anymore. Selected pairs are more profitable in shorter time. I read irmscher's review that says, "If you wait for a perfect signal it would take you weeks or of waiting, as it appears only a couple of times a month at best." huh? I see this setup several times a day. https://www.screencast.com/t/BDdbmiHwI and newtrojan:"the signal comes pretty late" Have you considered trading the pullbacks? Great indicator. Bernard, you are the best. Thank you so much for you time and effort creating such useful indicators for people around the world. You deserve 5 Stars. I rented this Indi from today for three months. I will give this Indi a Change. I write every day that I trade my results and see what came out in three months. Hope, it works. Great, just great - one of the best indicators I have used and excellent support! * sublime support level ! I would however suggest to combine this indicator with another indicator by the same vendor for even greater ease of use : Advanced Currency IMPULSE with ALERT. This combination makes trading real child's play ! Well done, Bernhard, and thanks a million ! Great system, completely changed my trading and was exactly what I was missing to see the bigger picture of what the market was doing instead of opening 28 charts and watch them constantly. Well done! Great support, Bernhard answered all my questions before I rented this indicator. after hours study the rules and system, it gives me the new direction to look at the market as what makes trending and how can I define OB and OS. In my pass trading experience, I usually buy high and sell on the bottom, always catch the end of the trend, but this indicator allows me beware the end of the trend with high probability which is amaze me:) keep up the good work. This indicator is absolutely amazing! It helps so much in analysing a chart and it is so easy to use, the signal is always accurate. This is the first iindicator that is giving me constant profits so far. No regrets!! Highly recommended!! Easy to use and great support from Bernhards! The difficulty is to choose a good stop loss or take profit. I don't earn money with it. 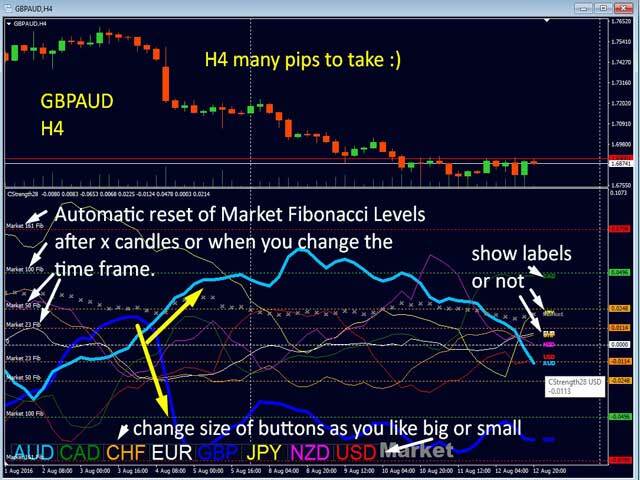 I have been using Bernhard’s Currency Strength28 indicator since the beginning, before it was made available on MQL5. 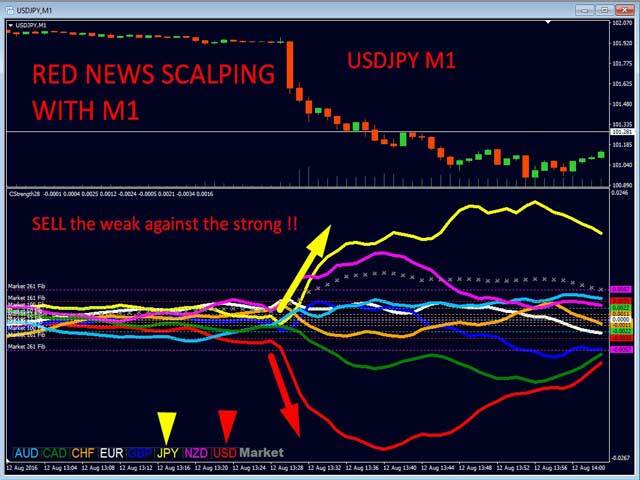 I have used many of the currency strength indicators that are available for MT4. Most provide point-in-time numbers that reflect the strength of the eight (8) individual currencies. The strategy is to pair a strong currency with a weak currency, thereby identifying a currency pair that is likely to move in a particular direction. However, like all indicators, currency strength indicators are lagging … they tell us about the past. When you look at a chart, you can see the result of price movement based on past strength and weakness. Even though currencies might be strong or weak, the move on the particular time frame you are looking at might be over. The Advanced Currency Strength 28 indicator is different than all the others. It shows us the past in graphical form. Each currency is represented by a line and we can see where strength/weakness has been, and guess where strength/weakness is going. While there are other indicators that track currency strength over time (e.g., Fatman from Hawkeye Traders), in my opinion Advanced Currency Strength 28 is the best currency strength indicator on the market. (I have used Fatman, and despite its considerably higher price ($540), it doesn’t hold a candle to ACS28.) Bernhard has continuously updated this indicator based on feedback from his customers. At this point in time, the current version available on MQL5 is outstanding. There are many ways to use ACS28 and its companion indicators – Advanced Currency IMPULSE, and Advanced Accumulated Currency Volume. Angle of currency strength change is very important, as is the distance from the zero line. When two currencies are a great distance from the zero line, they are likely to regress back to the mean. It’s as if the two countries need to rebalance for trade purposes and bring the two currencies back to equilibrium. Alerts are built into the indicators to tell you when currency strength and weakness are at the extremes. This is typically a retracement or reversal trading opportunity. ACS28 can be used on any time frame. There is also the ability to show two (or more) ACS28s in separate windows of the same chart – one for the current time frame, and one for a higher time frame. When the two time frames are in agreement, the trade is more likely to be successful. I like to use the next timeframe up. With M5, I also show M15. With M15, I also show H1, and with H1, I also show H4. ACS28 works in tandem with Advanced Currency Impulse. Impulse is like an early warning alert. The analogy is as follows – if ACS28 speed, AC IMPULSE is acceleration. IMPULSE comes with its own vertical line alerts, as well as pop-up, push and email alerts. Seeing these alerts on the chart is very helpful. For those who use Ninja Trader 7, the vertical line alerts are like Bloodhound racing stripes. There are third party providers who make indicators that work with ACS28. I particularly like CS Angle Lines (available on MQL5) that show what Bernhard calls the Golden Angle. When currencies achieve this “golden angle”, they have momentum. There are trade opportunities when one currency has the golden angle slope (or steeper) and a second currency is flat (a single GAP). One can expect the greatest momentum when two currencies have the golden angle slope in opposite directions (a double GAP). If two currencies are moving in the same direction, it’s time to wait for a better opportunity. I like to use Kashif Javed’s ACS28 Gap indicator along with ACS28 (http://javedfxsolutions.wixsite.com/javedfxsolutions/acs28). 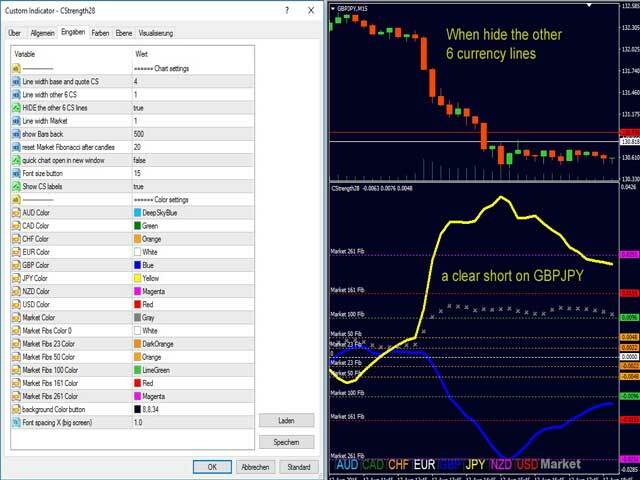 It provides racing stripe alerts on the chart when the difference between the angles of two currencies are greater than a user defined amount. These can work in conjunction with the racing stripes provided by Advanced Currency Impulse. ACS28 shows up and down arrows on the indicator itself and on the price chart when the currency strength angle achieves a threshold steepness. This value is adjustable, but sticking with the defaults works fine. Bernhard specifies angles in terms of Fibonacci levels. These angles are used by ACS28 and third party addons (like ACS28 Gap). This avoids the problem of angles changing based on zoom level. The Golden Angles are helpful because they appropriately change with zoom level, and you can compare currency strength slope to the Golden Angle lines drawn in the indicator window. Bernhard’s volume indicator is also helpful because it shows the volume for each currency across the 28 currency pairs. When there is a volume spike, it can mean that the buyers/sellers have exhausted themselves, and that price is due for a pullback or reversal. There are many ways to use these exceptional indicators. There are detailed instructions on how to use these indicators and a SKYPE group for current users. 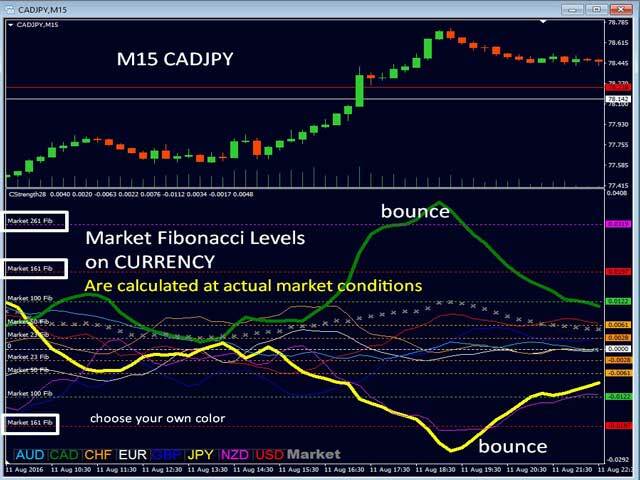 I suggest that you purchase both the Advanced Currency Strength 28 and Advanced Currency IMPULSE and learn how these indicators can work best with your trading style. Both these indicators (Advanced Currency Strength and Currency Impulse) are amazing! I like the idea of switching to different pairs with just 2 clicks, I will not trade without it! 5 stars: Very clever indicator, it bring many ways to read market and take good decision from. I also must thank the always good and fast support from Bernhard.Enjoy the pips! Thanks Bernhard for this great indicator and great support!!! Not working for me. The signal comes pretty late. Most of the time the momentum has already passed. The developer support is great though. I've been trading for over 9 years now and for the past 1 year six months I have been using Bernhard indicators, from CS28 and now an upgrade version of ACS28. ACS28 is by far the best indicator I have ever used. I am killing the market with pinpoint accuracy trading 15 min Time frame and 1H time frame. Failure is not an option with this indicator. Knowledge is power, once you understand how to apply this indicator to your charts the rest is history. This is the best indicator I ever have in my two years of trading. Been trading forex and shifted to binary options and they both work in forex and binary options. 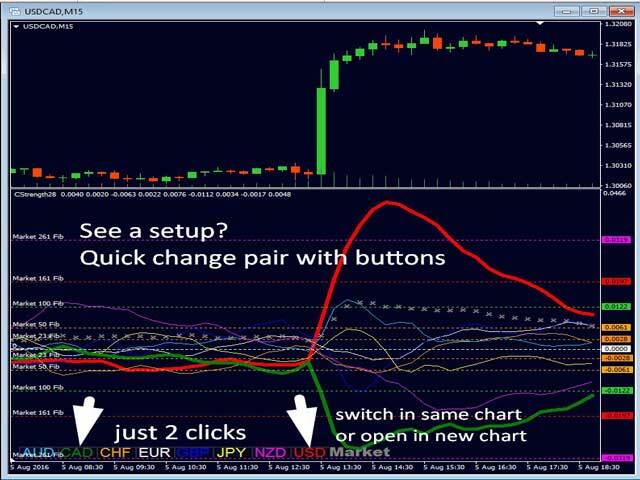 Been using the triple screen in binary options and this indicator is awesome. It signals the best entry point. The key is PATIENCE. Wait for the 2 (CS28 and Impulse) indicators to agree on each other on 3 TFs (M1, M5 and M15 FTs), have a good oDIR or iDIR angle pointing up or down and pull the trigger. Thank you Sir Bernhard for this great indicators. NOTE: Please share me your settings to trade binary options using CS28 and Impulse. I will appreciate it so much. I was skeptical at first but read all the great reviews, I decided to give it a go and I love love the products!! I brought all three 28, impulse and supply and demand. They are a complete trading system! Like everyone else said, Bernhard replies to any questions you have quickly. Totally worth it if your thinking about it!! Awesome work indeed. For sure a Must-Have. Support is also fantastic! I've been trading for a few years now and have seen just about every kind of indicator. This is by far one of the most impressive, maybe even the best, indicator that I have ever used. I've tried to use currency strength meters in the past but it never really clicked with me until I used this one. I trade reversals so it's critical for me to get in with confidence that the market is exhausted and is about to move in the opposite direction. This indicator is exceptional at calling tops and bottoms when one currency is overbought while the other is oversold, even in a market that is trending or one that has broken out. And when I say 'oversold' or 'overbought' I mean it relative to the market as a whole, not just that particular pair, which is what this indicator provides in *real* time. The great thing about it is that it doesn’t lag price action while providing enough smoothness to eliminate short-term noise that may be affecting one particular pair, as opposed to one specific currency as a whole. When you see lines reversing at the fib levels it really is a sign that price action is gathering momentum and price is beginning to reverting to its mean. Whatever your style of trading I’m confident that the ACS28 will provide you with an extra edge and an exceptional view of the market that will make your trading much easier. Great indicator when used in conjunction with the Impulse indicator. It confirms which currency is the strongest and weakest and you can use that to validate any other signals. Support is great. Vendor is always available and willing to answer questions. Even challenging ones.. A well deserved 5 star for now. Update: With the addition of the Cross detection option the product becomes even better. This feature can be used to effectively filter fake signals from other indicators. I recommend going forward to keep the future options to a minimum so as to prevent the product from becoming too complex and bloated. Less is -- Always -- More. Since starting to use Bernards system I've done away with almost all my other indicators, trading only with CS28, Impulse and the C Volume indicators. This really is a complete system and by following the rules I'm profitable and very happy with this style of trading. Using currency strengths in this way to identify the best pairs to trade seems really obvious once you start using it and I wouldn't go back to my old system. The support is also top notch, regular updates and new features are added all the time. the very best indi i ever used, excellent for scalping as well for long therm! great support by bernhard - thanks a lot! Excellent indicator and Bernhard provides amazing support. The Impulse indicator complements Strength 28 very very well. Highly recommend both indicators. Thanks Bernhard for a great indicator! This is a "must have" for the serious trader. I have purchased and/or reviewed other currency strength indicators but this is the best by far. The dynamic Fib lines are a unique twist that help you keep up with a changing market. And the support provided by Bernhard is excellent. If you take the time to learn how to really use this indicator, it could prove to be the "missing link" in your success as a trader. I'm not very happy with this product, it's next to useless for me. To be effective you need all 3 indicators, I have only 28 currencies and impulse and I only lose money most of the times if I follow the signals given by these. If you wait for a perfect signal it would take you weeks or of waiting, as it appears only a couple of times a month at best. Finally I found the indicator I was looking for. The best 44 dollars I've ever spent. A wonderful product, not just the product is super but the developer. Bernhard is very competent and is always available for his customers. Besides, his daily analysis on his message site are fantastic. Advanced Currency Strength28 possesses an almost predictive nature as the whole forex market, involving the major eight currencies, is taken into account when processing the calculations. It is a highly recommended software that requires a learning curve first. Klasse Produkt ! Die Sichtweise auf die Märkte ist gegenüber der herkömmlichen TA wesentlich besser und somit profitabler. Obwohl ich bereits mehr als 25 Jahre im Forex Markt "auf dem Buckel" habe, muss ich sagen, diese Strategie ist ein Highlight und lässt fast alles im Schatten stehen. Ich nutze es in der Kombination mit Advanced Currency Impulse und Advanced Currency C-Volume - ein erstklassiges"Waffenarsenal" für den Forex-Markt. Auch der Service ist wirklich 1A - superschnell, hilfreich und nett. I have purchased several other currency strength meters before and I find the Advanced Currency Strength28 Indicator is the most accurate and responsive. It is the best and I can't recommend it high enough as a trading tool to read the price actions. Thank you Bernhards for sharing this excellent piece of work. Der beste Indikator; ich nutze ihm zum scalpen. Einfach wunderbar. The very best indicator and strategy I have ever used, top notch support from Bernhard and he has put together a monster system. Fixed some graphical issue when used twice on a chart. Optimized functions associated with updating external chart data and PIN. Corrected the resizing of the sub-window when use "HIDE the other 6 CS lines" = true. On lower timeframes, the HIT alert might pop up quite often. Now the repetition of HIT-alert is set to wait for more bars with smaller timeframes. Note it is handled for each currency separately! A new input has been added at the end of the input list. "0" means it is automated but the trader can enter here any number of bars. Fixed an issue with the alert on the cross pattern. Optimized "set PIN" when "use higher timeframe" is set to true. Optimized dynamic Market Fibonacci and GAP-arrow when setting input "use higher timeframe" = true. Added several PINs (global variables) with GAP-arrow to work with external tools or EA-development. Optimized the function to rest the visual of sub-window to be faster when the timeframe is changed. Made several compatibilities to use with the strategy tester. Improved function with Market Fib23. Old inputs to hide Market Fib23 and Fib50 removed. It is not anymore needed. Added new buffers to show historically the dynamic Market Fibonacci reversal levels instead of horizontal lines. If showing the higher timeframe on a lower timeframe chart the lines are now synchronized with the higher timeframe candle close. Added a message in subwindow for the last signal with the time of your broker or local PC. This message can now be seen in a demo-backtest. Added a new feature to draw lines in bold. This will override the automated choice for the base and quote currency. The sequence does not matter. Optimized the function and the message for the update quote charts. The update on cross pairs is now set to true. External chart data should continuously be updated. Changed default setting of the hook alert to 16 Market Fibs value angle/slope to not miss out on reversal alerts or possible take profits. Optimized function for the cross alert. By default, the cross alert is now set to true. Since last update was added open support charts for USD pairs. Now you can also update all cross pairs. + run support charts also on cross pairs! It will open only ONE update chart and update all cross pairs on this chart in the back ground. The function is set off by default. You need to change the input to true to use it. Optimized drawings of the arrows in the sub-window. Another magic function will automatically open 7 support charts in the background to speed up the broker feed and update the external history data. When the indicator is applied to another timeframe those charts will follow. While using multiple indicators those charts will be shared. (This function can be deactivated.) Please read the user manual blog. Place a global variable with name "EAcall" and value of 123 to deactivate all alerts and unnecessary graphics. To use the indicator as normal on a chart change this input. + easy EA calls: set global variable "EAcall"
Optimized drawings of the arrow in sub-window. Optimized drawings of the Outer MFib stop. As requested by customer I added a special alert of a cross pattern. By default is not active. + added a historical Market Fibonacci 23 line and buffer in sub-window. + added arrows in sub-window to show strong currency momentum GAP. + added warning signs in the main window for individual chart when the base or quote currency is in oversold/overbought zone (outer market Fibonacci levels). + added pullback/reversal alert when currency strength drops back from outer range. All the graphics are based on the new buffer which represents historical Market Fibonacci 23 line with dynamic Market Fibonacci values. + Added for developer Global variable with TF for Market Fibonacci 100 value. Improved function to read correlated external pairs. The dynamic Market Fibonacci Level lines will reset after 2 candles by default and reflect so the actual Market activity. + Use currency specific characteristics!! This updated indicator version has been coded to use each currencies specific characteristic! The character of a currency is what makes it act differently to another currency. Currency pairs have many characteristics. We have created a proprietary formula which takes account of this characteristic and many others and believe it is the first of its kind in the forex world. Therefore we can say each currency is handled on its OWN characteristics! Vertical spacing for big screens like 4K monitors to correct currency names/buttons on bottom of sub-window.